Valentine’s Day is less than two weeks away. If you’re thinking “how did that happen, I just said goodbye to the Christmas decorations,” don’t fret. There are lots of ways to spread the D(I)Y Love You this February 14th, and I’m thinking outside the box. The traditional flowers and card route is nice, but I like a good DIY when I see one, and couldn’t resist sharing these heart-themed picks. 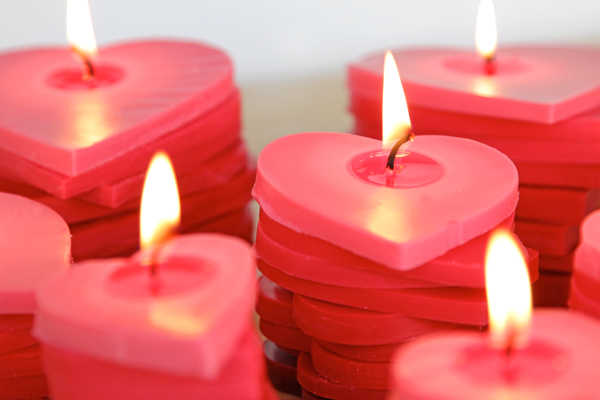 Let romance find its way into your décor with these stacked ombre heart candles from Hands Occupied. The yarn-focused blog steers clear of knitting this time around, aiming straight for Cupid’s heart instead. Set the mood for a romantic meal with these candles stacked artfully on the dinner table between you and your guest or light them in your bathroom while you enjoy a relaxing (and well-deserved) soak in the tub. These also make fun school favors if you’ve got young kids. Clever DIYs get extra brownie points in our book, and this perfect match tutorial from lifestyle site Say Yes doesn’t disappoint. 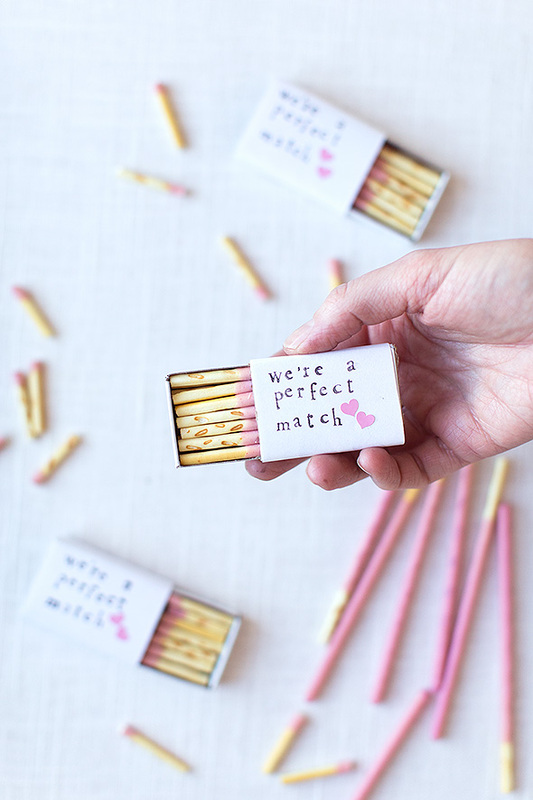 Strawberry Pocky sticks disguised as matches = deliciously genius! All you need for this project is a stack of matchboxes and a mini stamp set and you’re ready to go. These make great party favors, but don’t be surprised if they go fast. 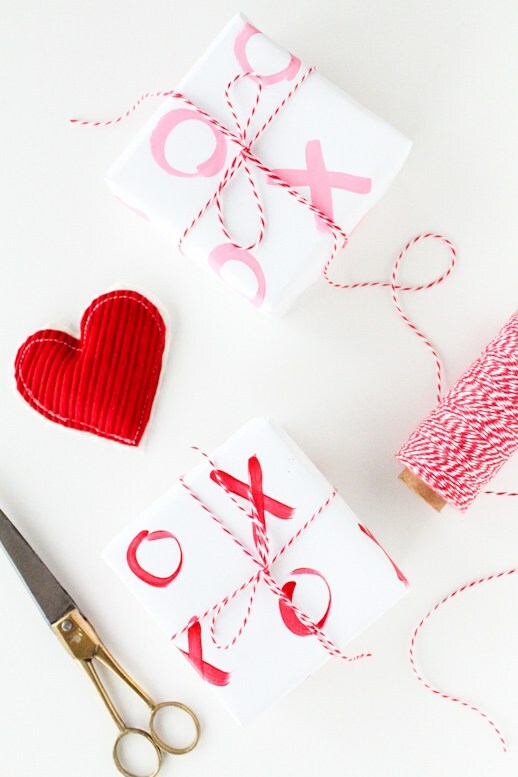 Art lovers, this XO gift wrap DIY has your name all over it. Sugar and Cloth perks up any gift you’re giving with this homemade wrapping paper. It’s so easy to make, but exudes major charm. Another sweet idea: wrap empty boxes in this whimsical paper and stack them on your dining room table for a fun take on the classic centerpiece. Don’t forget to share your favorite Valentine’s Day DIYs with me in the comments below or on Twitter @HOFunkDesign.